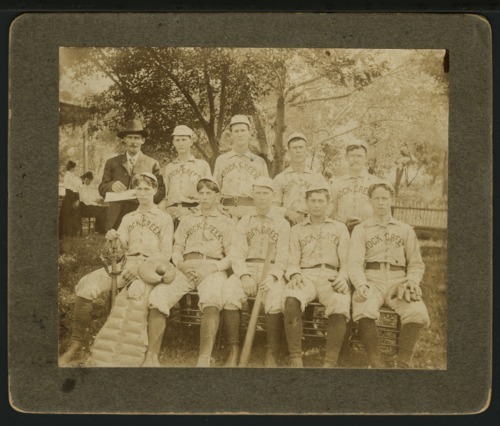 This photograph shows the 1904 Rock Creek baseball team in Jefferson County. Team members are identified on the reverse of the image, but the identities are not clearly matched with the individuals in the photo. Members include: H.B. Dougan (p); E.E. Edwards (c); T. Welsh (1b); T. Martin (3b); W.H. Martin (rf); E.M. Edwards (cf); W.H. Edwards (lf); J.S. Martin (2b); A. Hugg. The back of the photo also bears a faint stamped imprint, "Sep 4 1904." This photograph shows the 1904 Rock Creek baseball team in Jefferson County. Team members are identified on the reverse of the image, but the identities are not clearly matched with the individuals in the photo. Members include: H.B. Dougan (p); E.E. Edwards (c); T. Welsh (1b); T. Martin (3b); W.H. Martin (rf); E.M. Edwards (cf); W.H. Edwards (lf); J.S. Martin (2b); A. Hugg. The back of the photo also bears a faint stamped imprint, "Sep 4 1904."